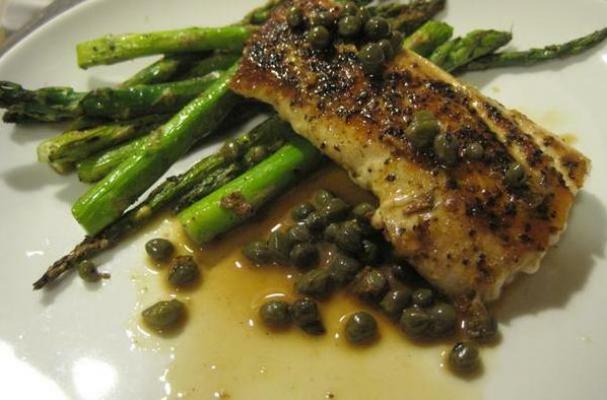 Mahi-mahi is an often forgotten fish that shines in all the same ways that halibut and tilapia do, especially when dressed in a buttery but tangy sauce with lemon and fat capers. It’s a super simple fish recipe that’s incredibly easy to cook, and even easier to pair with a healthy side of broccoli or asparagus. Prepare the fish by sprinkling each side with salt and pepper (or lemon pepper). Pour the olive oil into a stainless steel pan on medium high heat. When the oil is hot, test it with the tip of the fish fillet. If the oil crackles from the touch, your ready! If not, it needs to be hotter to get the sear the dish needs. When the Mahi-Mahi is cooked (usually 3-4 minutes per side depending on the thickness of your fillet), remove and cover loosely to keep warm. Add the butter to the hot pan and melt. Sauté the shallots until softened in the melted butter. Add wine, broth, lemon juice, and lemon zest to the pan and use a spatula to scrape up all the browned bits (aka deglaze the pan). Allow the mixture to simmer and reduce by 1/3 to 1/2, stirring occasionally. Note: you can adjust the wine/broth ratio according to your tastes and how much wine you have left in the bottle by the time you get to this step ;). Add the rinsed capers and simmer one more minute. While you are waiting, plate your fillets. Pour the sauce over the top.